HELLO LAKE RESTORATION. GOODBYE POND AND LAKE WEEDS. 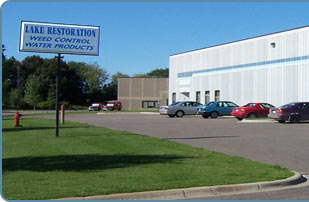 Located in Rogers, MN, Lake Restoration has been making lakes and ponds safe and clear for 40 years. Thousands of homeowners and cabin owners use our products to control aquatic weeds each year. These products may be purchased through our catalog, at our retail outlet, and on this web site. Selecting the right product is easy. Use our Product Finders to choose the right products for your Pond or Dock and Swim Area. The selection guide will quickly help you identify the products for your needs. We have designed the LAKEMAID®, the TORMADA® and Goose D-Fence. We also offer our Lake Restoration pond and lake products for treating your water for aquatic weeds and algae. The LAKEMAID® is the ultimate automatic weed removal system. The LAKEMAID® is easy to assemble and operate and can completely clear the thickest area of weeds in a matter of days. The LAKEMAID® takes all of the hassle out of clearing weeds and scum from your lakes' sandy bottom. Go ahead. Jump in and feel the sand beneath your feet! The TORMADA® product application boat is an unmanned, lightweight boat that allows you to treat your pond or lake with ease from a dock or shore using a remote controller. Drive your weeds and algae away when you use the TORMADA® on your next product application. The Goose D-Fence® is our patented retractable fence that creates an inconspicuous barrier, protecting your lawn from unwanted geese. Our featured products include: Dibrox® and Spritflo® Herbicide, and Mizzen® Algaecide. Our product line-up also includes our muck eliminator, nutrient reducers, and pond dyes. We want to provide you with season-long weed and algae control so you can enjoy your summer on the water. Give us a call with any questions you may have about our products or services, or stop by our retail store to speak with an Aquatic Expert. We look forward to helping you!